Let’s face it - to survive in the photography business you don’t just have to be a good photographer and a good salesperson. You also have to offer your clients top-quality photo products that give them a unique way to display their photos (and which help you improve your bottom line too). 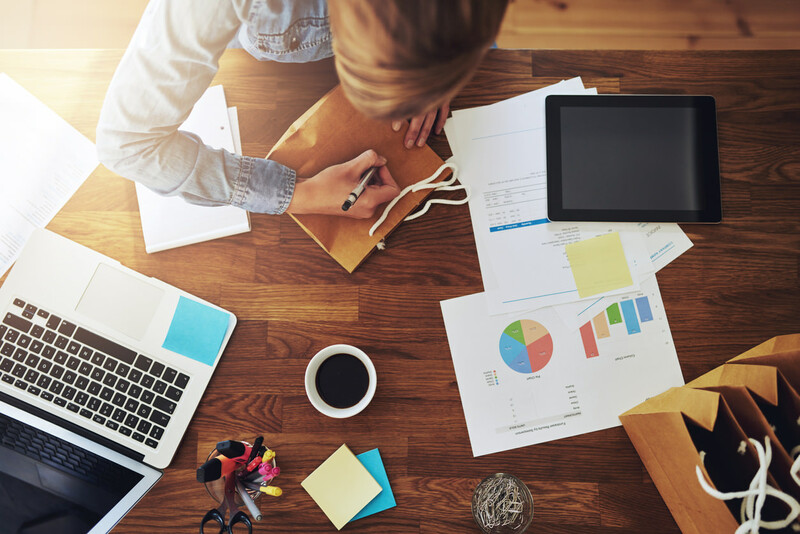 With all that in mind, let’s have a look at our 11 favorite products to increase your sales. This leather Gigi handbag is an attractive and classic way for your clients to display their favorite photo. With turned leather handles and a variety of pattern-printed gusset trims, this bag has tons of style. There’s a top zippered closure to ensure the items inside are secure, and an interior zip pocket, two slip pockets, and three interior compartments to help keep things organized. What better way to show off a favorite photo than on such an eye-catching accessory? Learn more about the Gigi Handbag. Whether it’s a gym bag, a yoga bag, or a bag they take on short trips, your customers are sure to love the functionality of this handy tote. The elastic side pockets make carrying water bottles a breeze. Inside, the roomy interior will accommodate gym clothes, a yoga mat, and more. With an interior zipper pocket, keys, money, and a phone can be safely tucked away. 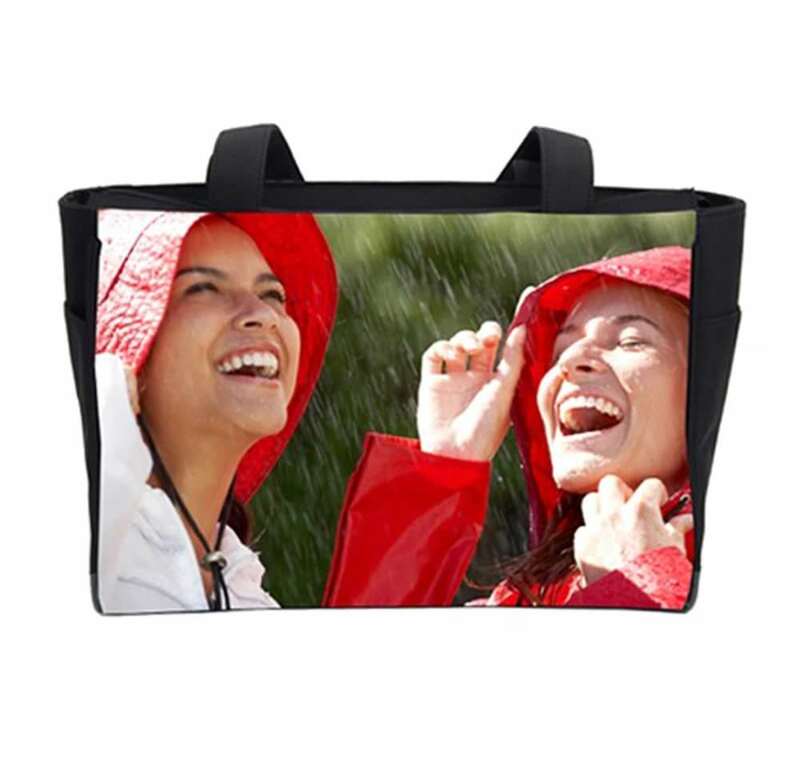 Made of durable fabric, this bag will stand the test of time and give your clients a fun way to display their favorite photo for years to come! Learn more about the Workout Bag. 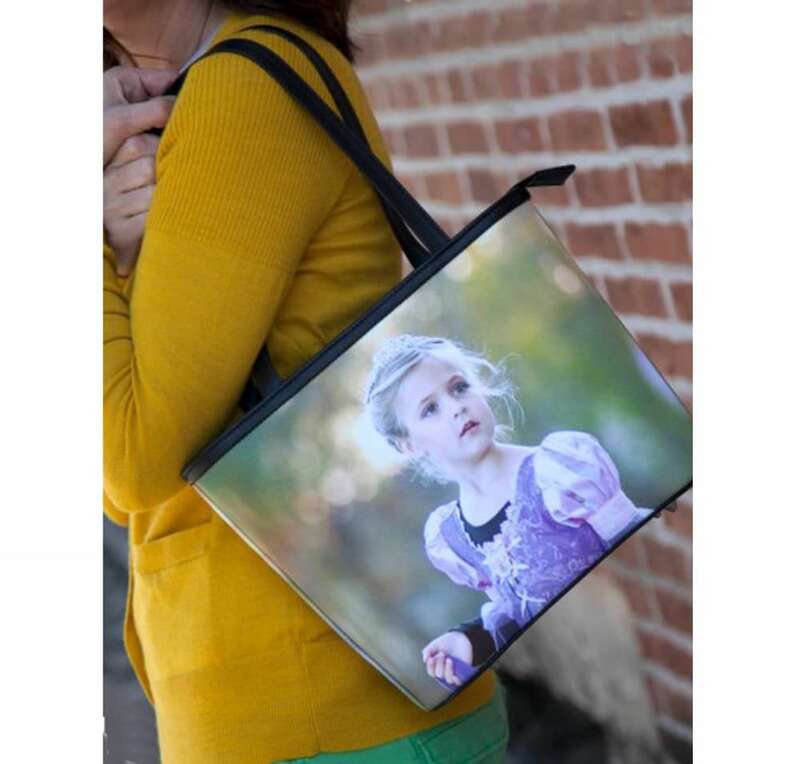 This designer-inspired handbag isn’t just stylish with microfiber or black leather construction, but it also gives your clients a way to proudly display photos of their kids, grandkids, or other family members. Like the Workout Bag above, the Bucket Bag has a top zippered closure for security and two slip pockets and an interior zip pocket for small items. Better yet, the bag can be made with a photo on one side, or if desired, with a photo on two sides. Learn more about the Bucket Bag. For clients that have a lot to carry around, this tote offers a ton of space that will give them the functionality they need and the personal touch they desire with a large photo printed on the exterior. Inside, there are multiple pockets to carry just about anything with ease. 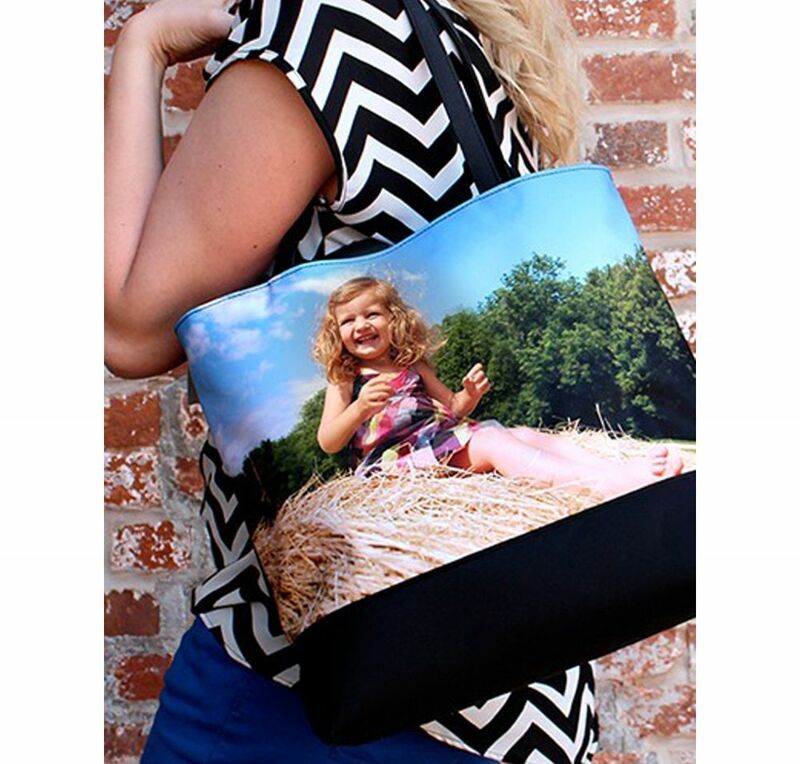 Made of durable fabric, this tote will prove to be a reliable tool for years to come, and one that has special meaning with either one or two photos displayed on the outside. Learn more about the Tote. 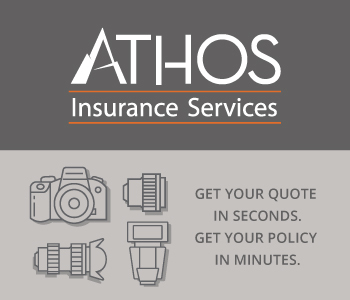 Give your clients the ability to carry all their valuables safely and securely, but in a package that shows off their favorite photo memory. This large photo wallet can hold cash, cards, and even a mobile phone. The wallet is constructed of full grain leather accents, and the image is printed on durable fabric that will hold up against all the daily usage of the wallet. Better yet, the wrist carrying design makes it easy to access and is a fashionable statement too! Learn more about the Large Wrist Wallet. In today’s world, there’s often a need for a larger tote that can accommodate things like a tablet or iPad. This Crossbody Bag is the perfect vehicle for doing so! The bag has a sleek design with an easy-to-use flap and magnetic closure on top so your clients can quickly and easily access its contents. 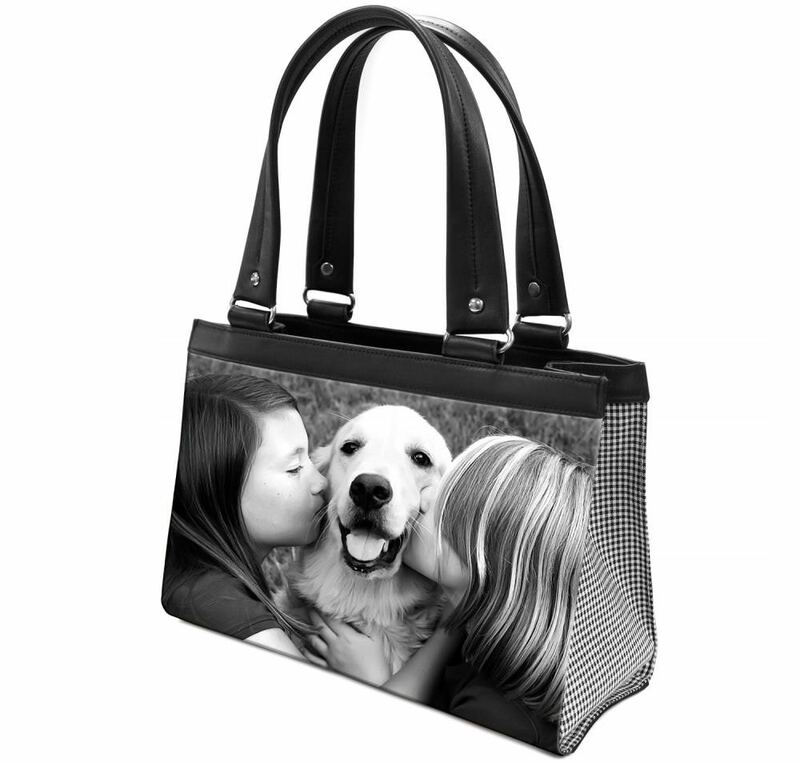 What’s more, the durable fabric on the bag’s exterior is a perfect surface on which to have a favorite photo printed. What a great way to display a favorite family memory! Learn more about the Crossbody Bag. This full grain leather and fabric wallet has a clean, modern design that is both functional and stylish. On the functionality side, your clients can store credit cards, coins and cash, a checkbook, and more. There are twelve credit card slots and a handy ID window for a driver’s license. There are three interior pockets as well that keep small items nicely organized. The secure snap closure ensures that the wallet’s contents are safe and secure, while the image printed on the wallet’s exterior is sure to please its owners and people that view it alike. Learn more about the Signature Wallet. Don’t neglect your male clients! Offer this tasteful and masculine men’s wallet to give your clients a beautiful gift option for their sons, dads, and grandfathers. 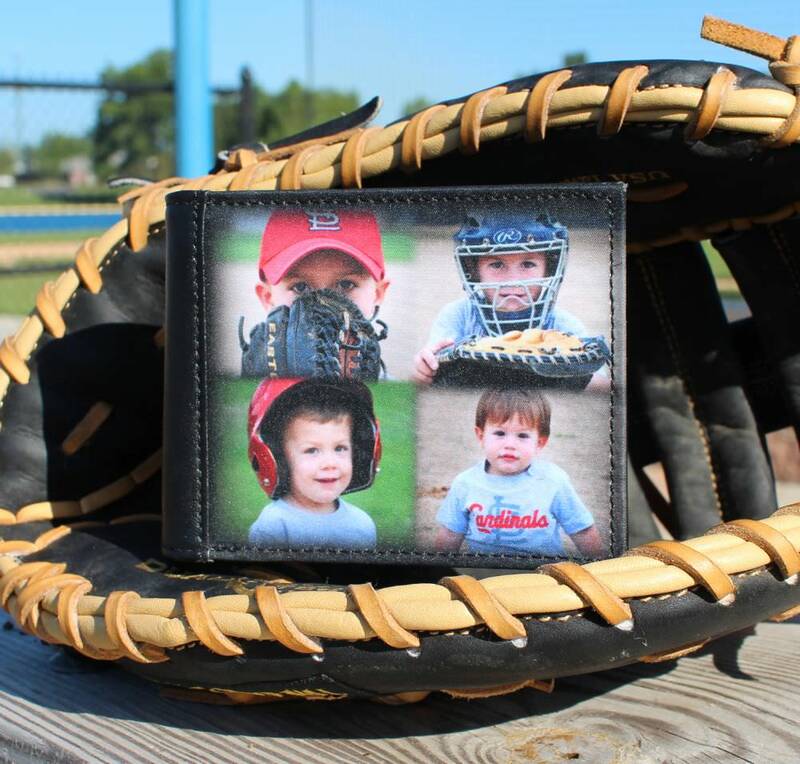 With this understated custom leather wallet, the men on your client list will be able to keep their money and cards organized, while also getting to see photos of their favorite people each time they pull out their wallet. Learn more about the Men’s Wallet. For your clients that want something functional and fashionable while also offering flexible storage solutions, this clutch is a perfect product! It’s large enough to hold a wallet, phone, lipstick, and keys, but small enough that it can be placed inside another bag for additional storage and organization. 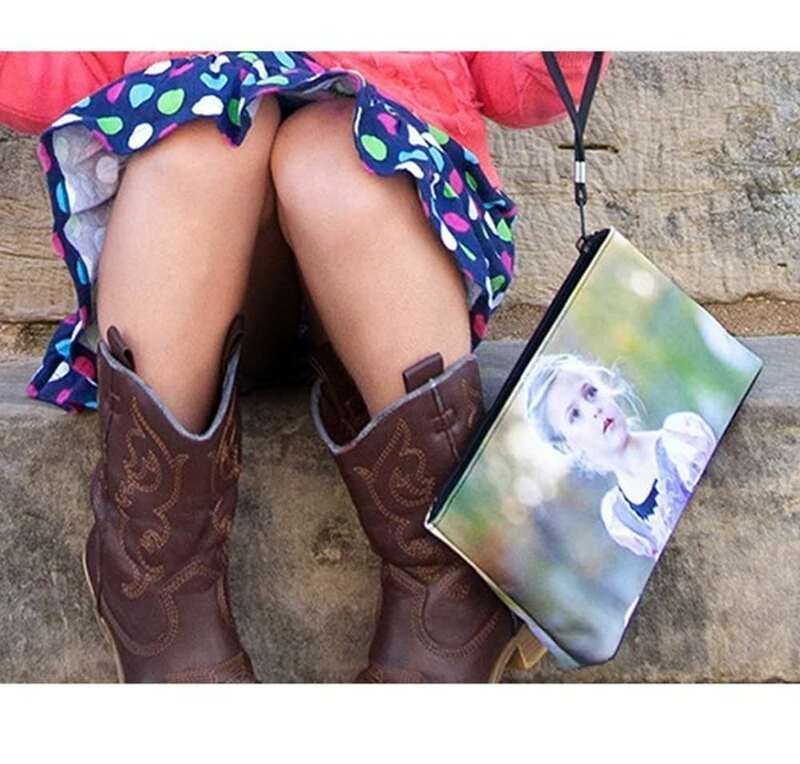 Best of all, this clutch will stand out from the crowd with a full-sized image printed on its exterior so your client can show off who she loves most in this world. Learn more about the Clutch. 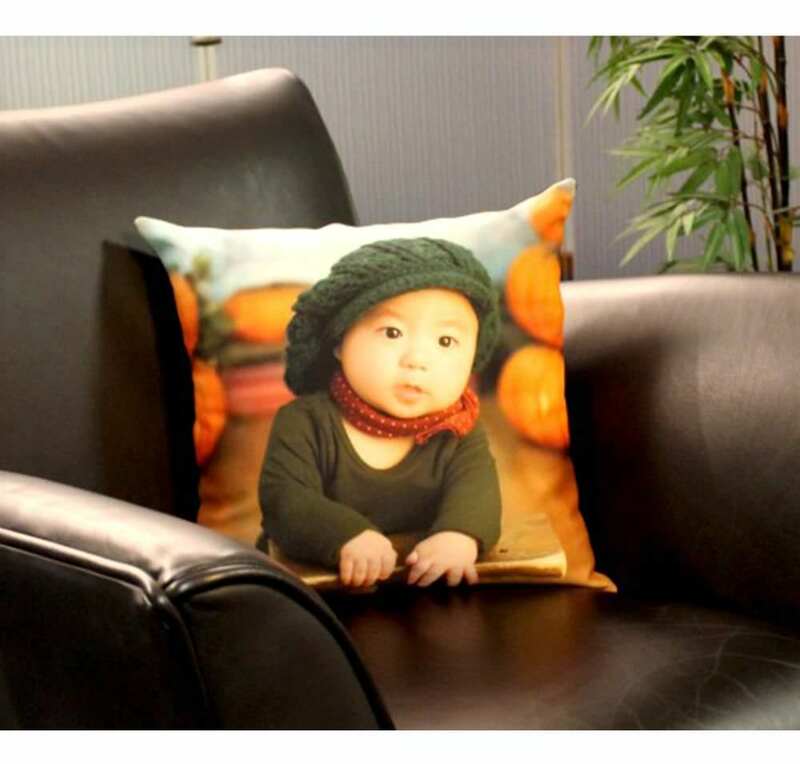 What better way to display photos in a novel way than with a custom-printed throw pillow? This pillow is constructed of microsuede for a soft, warm touch, and provides a great printing surface so it’s photo cover really pops. The pillow is even washable, so you don’t have to worry about spills or accidents ruining it! Add this pillow to your product line, and give your clients the ability to add personal touches to their home and the homes of their loved ones. Learn more about the 16” Pillow. For clients that need a bag that can hold large items like a laptop, this is the bag for them! The double buckle and Velcro closures on top means the bag’s contents will be safe and secure. The bag is made of durable fabric that means your clients will have many, many years of usage out of the bag, even if it’s in a rough and tumble fashion. Better still, your clients have a large canvas on which to have their photos printed for a daily reminder of the people and pets they so adore. Learn more about the Messenger Bag. An easy way to improve your bottom line is to join the wholesale program for photographers at Snaptotes. All you need to do is fill out a simple application, and, once approved, you get a 35% discount which allows you to make more profit on the photography-related items you sell on Snaptotes. Build and promote your brand with quality products that generate more sales! Visit the Snaptotes Wholesale Program to learn more and to sign up today.